After reading Ishmael, I wmanted to get my hands on everything Daniel Quinn has written. Thank you, Nrrdgrrl, for bringing me these from the States. 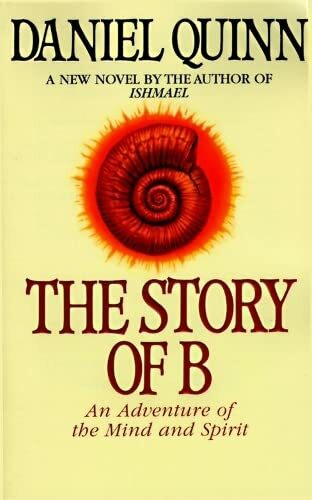 The Story of B is written along more or less the same vision which was so shattering to me, only now on a much more spiritual level. I appreciated the new insights. I gave this book to Greta, one of the most spiritual people I know. I hope to hear from her what she found. Gretta brought this book to my house a few days ago. Just finished. Wow. Still more to think about. Thanx again biba, Quinn keeps hitting home. This book is home again, for further reading. Edit: apparently I lent it to someone, only this person hasn't journalled it and neither have I. So I do not know its whereabouts anymore. Hopefully it will return to me one day, because I am pining for it. I need to get another copy perhaps. Anyone? It came home yesterday! I will reread it soon, after finishing Derrick Jensen, another step on my quest for a world I would actually want to live in.